I must really like Infinity, because I don’t usually buy into multiple factions for the games I play, but here I am. The arrival of Uprising brought a variety of new factions/sectorials, and since they include a mix of regular units and mercenaries, I already had a bunch of appropriate miniatures. 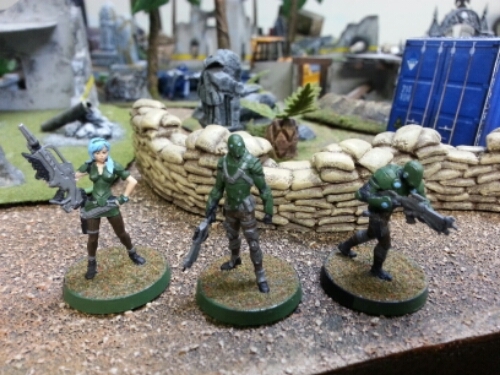 My old Yu Jing demo list has been given a new purpose, as the Keisotsus, the Wu Ming, and the Ninja all have homes in the new Ikari Company, along with my Desperadoes and a few others. I probably had more models for StarCo, but the pull of Ikari was strong, especially because it gave me an excuse to track down Yojimbo. No shortage of finicky bits on this thing. The baggage is suspended off the back of the seat, which is in turn pretty much suspended in midair. It looks cool as it comes together, but at first glance, the parts don’t even clearly indicate which end will be the front, haha. He also came with a pair of CrazyKoalas, which are significantly less finicky. Just a head to glue onto a body, and I feel like even that was probably not especially necessary. These guys probably could have been one-piece minis. The most brutal bit of multi-part cruelty is the right handlebar, which is this super tiny piece that you’re supposed to glue on and then (I guess) hope never brushes against anything? Can you say Further Adventures in Pinning? For this little project, I broke out the 0.6mm bit and a staple. The fact that I used a staple should give you some sense of scale where these pictures are concerned. The left handlebar is actually a part of the torso, and is molded into Yojimbo’s hand, but of course the right had to stand alone. It has to stand alone because it needs to hold an insanely long sword, which I fully expect to cause problems forever. I’m tempted to leave the blade unpainted so that there’s no paint to chip when the blade inevitably bends. So. Unlike the Maverick from the USARF box set, the pair of Mavericks come with little cargo containers that hang off the rear of the bikes. While they’re actually designed to have a fair amount/variety of surface contacts, they still struck me as pretty doomed without a bit of help, so I broke out the pinning gear again. The 3-surface bond actually made pinning a little trickier because it meant each surface was a little smaller, but left me feeling really good about how solid the joins are now that they’re done. I cannot picture these exhausts staying attached otherwise. With all the finicky stuff out of the way, they do of course shape up into great looking units. Personally, I particularly like this one, the fellow reaching for his sidearm. It’s such a dynamic pose that I was actually surprised not to find a heavy pistol in the profile. The resin bases are from Antenocitis Workshop, purchased through Warsenal a while back. I went to look into getting some more (the USARF box set means I have 5 bikes, and I only have the 4 forest bases), and I guess Warsenal has been clearing out the AW stuff; the 55mm bases were extra cheap so I snapped up another forest set and a badlands set. While I was at it I grabbed a set of 6 ‘Access Terminals’ that I’ve been eyeing for years. Definitely happy with those. Simple but effective, and they seem a lot sturdier than the fancier stuff we’d grabbed in the past. Back to the forest bases. They look great, but the level of detail makes them pretty brutal to get paint coverage onto them. Lots of hard to reach nooks and crannies, but they pick up drybrushing like nobody’s business. (That’s a Desperado and the USARF Maverick, I haven’t washed/primed the bases for the new ones yet, since I was waiting on that order to come in before I could base both of the ones from the boxed pair). I’ve been avoiding my Blackjack because I haven’t wanted to deal with the extra packs, plating, and fiddly foot bits, but I finally bit the bullet and started dealing with it. Paint-wise so far, I mostly used Vallejo Olive Grey for the major stuff and Citadel Warplock Bronze for the machine parts. Did some cleaning, fighting, and gluing as well, and got all those extra parts on now. I’ve been purely focused on the areas involving the extra parts, so the arms got no paint this time. Finished or not, I gotta get this fellow on the table soon. I haven’t even tried him yet and I’ve got his HMG buddy on his way. I finally got one. This particular Limited model drives me a bit nuts. Not because it’s desirable (which it is, it looks amazing), but because the regular version when it was announced was awful. I’m sure not everybody would agree on this, but I had zero interest in the non-limited Unknown Ranger. Heck, let’s do a quick recap for the folks that don’t know what I’m talking about. Corvus Belli do lots of limited edition miniatures. Most of them are alternate versions of existing models, and since those look great too it’s really just an opportunity to change things up a little. Grunt Spec Ops. Totally different; both totally fine. Unknown Ranger. What is even happening here? Maybe I’m unreasonably thrown by it, but I have yet to meet anybody that prefers the regular one. Anyway, I finally tracked down an LE Ranger for less than a bajillion dollars and snapped it up. Haven’t really started painting him yet, but he’s built and ready to field. We played Hunger Games last weekend. There were four of us, 2 Nomads, a Haqqislam, and my Ariadna . 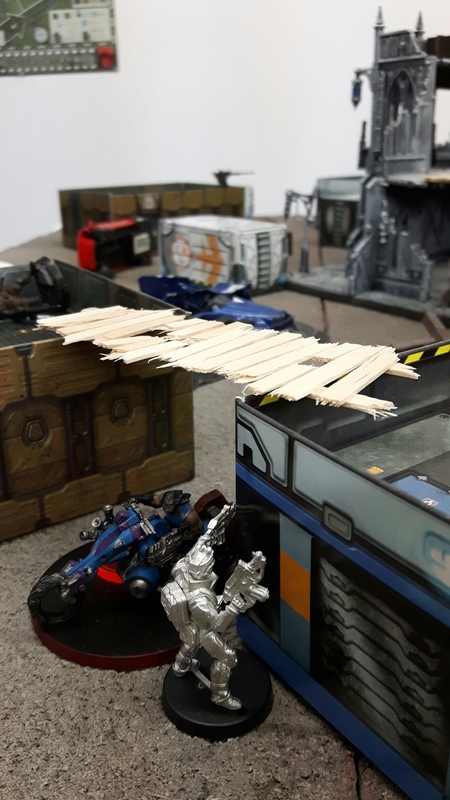 One of the Nomads is pretty new to the game, and Hunger Games made a nice light introduction for him, since he only needed a few miniatures put together for it. I brought Van Zant, an SAS, and a volunteer; the volunteer was the only model that wasn’t new to me. I won, but that was as much luck as anything else. I fielded the SAS poorly and he wound up facing off against Trevor’s Nomad sniper before my turn even rolled around. With a chain rifle and an assault pistol, he didn’t last long. I also lost the volunteer during the first round, but she took out 2/3 of Tyler’s Nomad force with her light grenade launcher before getting shot, so I’m calling that a win. It was a very quick and violent game, and by the time Van Zant arrived in turn two there were only a couple of soldiers left and everybody was charging around whooped up on their metachemistry rolls. The other thing I’ve done hobby-wise is put together a desperado. Lots of pinning, of course . Most of the major bike parts, plus a few in the desperado himself, and one linking the two together . 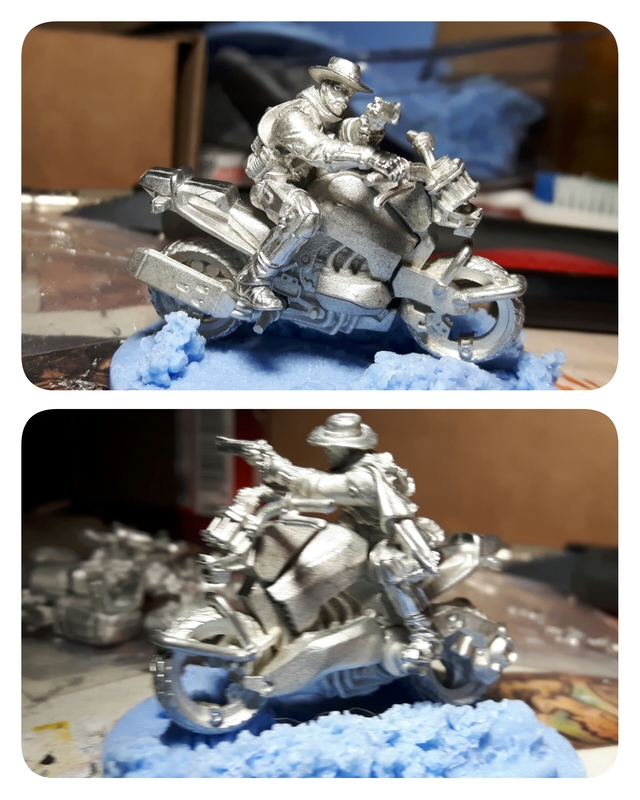 That one’s not fully glued yet; I’m thinking I’ll paint first and then combine them afterward (there are a *lot* of contact points between the rider and the bike and I feel like painting them afterward would be a nightmare). Got in a few Infinity games over the past couple weeks, and it felt good. This past Sunday saw me face off against a friend’s Haqqislam army twice. The first game mostly went well for me until the end. Between my Tank Hunter and my HMG Spetznaz (mostly the Hunter), most of Haqq’s impetuous phase involved bikers getting shot off the board. I had a couple big angles covered and had good luck with my rolls; probably less than half the smoke worked out for my opponent. The high movement of the bikers worked in my favour here, as my lines of fire weren’t overwhelming so much as the bikes advanced right into those lines. My first turn went into picking off the non-bikers. 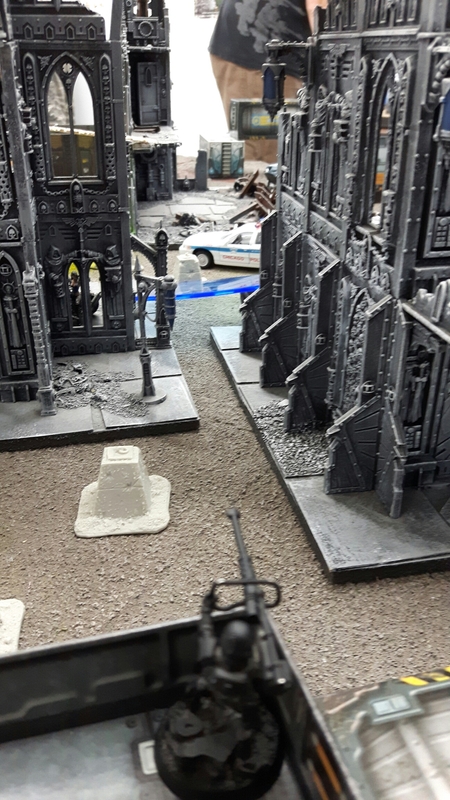 The Tank Hunter took out a distant missile launcher (down the long alley in the first image), and then the HMG Spetznaz worked his way around the buildings and across a catwalk to take care of the rest. In the end it all came down to a couple of dice rolls in a single order. His last biker came up against my Tank Hunter and my Minuteman in a suicide charge and nobody made enough armour saves. 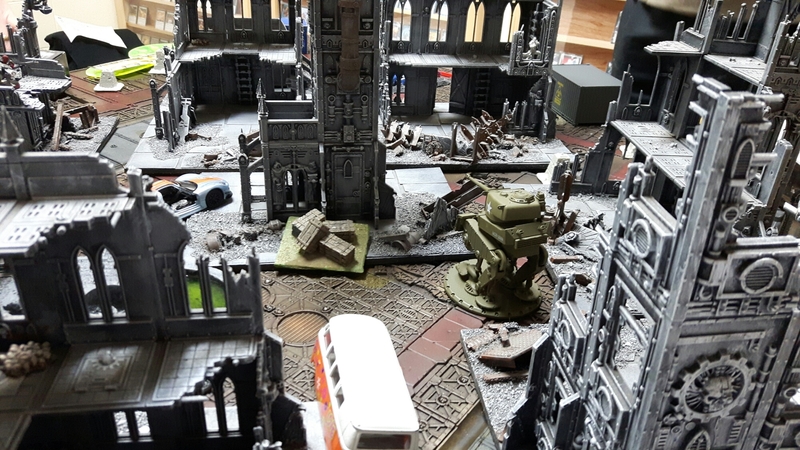 I went from a little over 100pts to a little under 50, which put us in the same annihilation bracket, and he had his Secure HVT objective complete already, so he won 5 to 3. A very fun, and very fast-paced game. We played Quadrant Control next, but that was a bit of a mess. I missed almost every roll, and often by only 1. I couldn’t hit anybody, and failed pretty much all my Armour saves. Tactically I felt good about my playing, but luck-wise I got hammered. 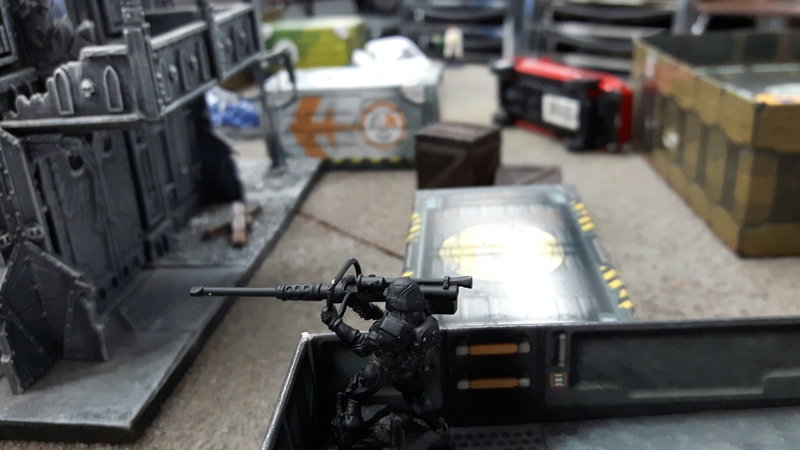 Still fun to be out playing Infinity, though, and I assembled the Minuteman just for the occasion (I wanted those twin flamethrowers in case I was battling Tohaa again). I also got in some Frostgrave this weekend, but I’m hoping to give that its own post. This past Sunday saw our first Hunger Games Tournament. It was also or first streamed infinity event, with mixed results. Unfortunately it was pretty choppy, but still pretty cool. One of our regular players just moved down to Michigan for a job, and he was able to check in on our games from afar; hopefully we’ll have it running a lot more smoothly by the time our August tournament rolls around. It’s potentially still in the ‘previous broadcasts’ at http://www.twitch.tv/thundergamesandgifts, if anybody wants to take a peek. Nomads had a very strong third round (their bshot bounty hunter rolled a multi sniper rifle as booty), but Tohaa took the day with a very strong showing. My Ariadnans did okay the first round, but might as well have been absent for the second and third; I had my worst tournament ever. Which is fine, but wow. Second game I was blown away in my deployment zone before doing anything, when the Tohaa ran up, marked me, and hit me with smart missiles, catching everybody in two shots. Third game the Nomads killed me before the Tohaa had even come out of hidden deployment. I was actually rolling plenty of successes, but they were all super low – like rolling a 1 to dodge a 4-round HMG burst, and so on. Bright side? 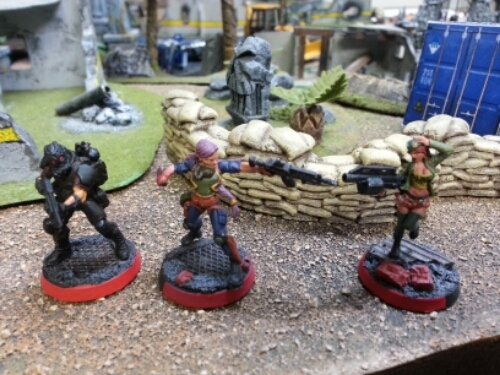 I didn’t go home empty handed; my Ariadna force was voted the best painted three man Hunger Games Squad! And in second place for Best Painted, the Nomads!